A bow is a weapon in Minecraft which fires arrows as projectiles. 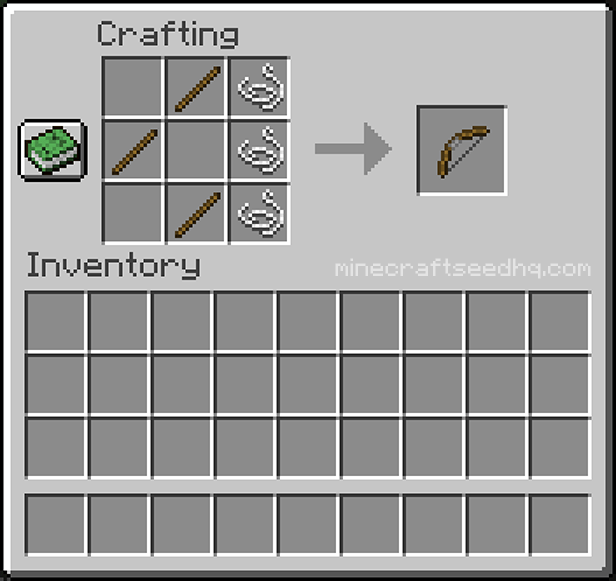 A bow is crafted with a crafting table from three sticks and three string. The crafting process creates one bow for each set of ingredients used. With 3 sticks and 3 string in your inventory, open the crafting menu. You will be presented with the 3×3 crafting grid. Arrange the stick and string on the crafting grid in the correct positions. The bow will appear to the right of the 3×3 crafting grid. Move the bow into your player inventory.